Disc sanders are a type of power tool that attaches sandpaper to a rotating disk that is used to smooth and grind the surfaces of materials. The principle is that the belt sander will propel sandpaper at extremely high rates of speed to make sanding more complete and efficient to perform. One of our favorite belt disc sanders was the Wen 6502 disc sander. Its manufacturers say that the Wen provides an easy and smooth sand that will remove jagged splinters and edges on all of your lumber and wood. It includes a 4-by-36" belt and a 6-by-6" disc and includes a 4.3 amp and a 1/2 hp motor with an easy to change belt, allowing you to swap out sand paper as needed. In addition, it has the ability to tilt from 0° to 90°, accommodating the requirements of your work piece, all while its cast-iron base prevents it from vibrating. A dust collection port enables you to connect your dust collector to its 2.5" port, minimizing the time it usually takes to clean up all of the debris and sawdust. One buyer that we spoke to had purchased it to work on some Shaker furniture that he had made. He required a sander that could work on extremely delicate areas of the furniture he had built and was pleasantly surprised by the wobble-free functioning of the Wen's disc and belt. He particularly appreciated the sturdy construction of the table and the exceptional miter gauges. That said, there are some other options available on the market- let's see how they compare. This 2-in-1 belt and disc sander offered by Wen is practical, versatile and an excellent choice for a sanding tool. Users love the solid construction, but some do note the miter gauge is loose. This belt sander combo has a size of 22″ x 11″ x 12.5″, an adjustable 4-by-36-inch belt ( 0-90 degrees), a sturdy cast iron base, a 4.3 amp motor, a 6-inch sanding disc accompanied by a support table, a miter gauge, and a stop bar. The package also includes an 80-grit sanding disc, an 80-grit sanding belt and a 2.25-inch dust port that you can connect to a dust extractor. In general, users have a favorable opinion of the Wen belt disc sander combo, and they praise its heavy-duty construction and performance. A buyer comments that it takes him a few seconds to change or adjust the belt and that he doesn’t have any problems to connect the dust port to his vacuum system. Another user mentions that he didn’t expect this wood sander to be so well-built and that the base doesn’t wobble at all. A happy purchaser shares that he shapes ax handles with the help of this belt sander and he fervently recommends it for small projects. However, some customers have complained that the quality of the disc table is poor and it isn’t perpendicular to the disc. Some clients also state that they had difficulties sanding thicker wood pieces and that the sander stopped working after a couple of days. 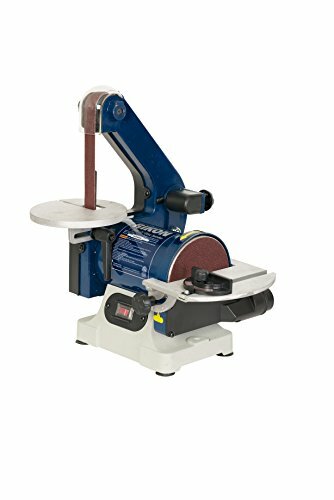 If you are looking for a practical and easy-to-use belt disc sander combination, you might try this 1 x 30-inch belt and disc sander tool offered by Rikon. Users love that it works quietly, but some do note that the switch is difficult to turn on and off. This blue belt sander combo has a size of 15″ x 12.6″ x 14.6″, a belt tracking knob, a belt table that can be adjusted from 0 to 45 degrees, safety on and off switch, a 5-inch disc sander, and 2-inch dust port. Overall, this is an item of high-quality suitable only for light work. In general, users are satisfied with the functionality and design of the Rikon belt disc combination tool. A buyer comments that this wood sander is so safe that even a 9-year old can sharpen a pencil on it. The reviewer also states that the disc sander works flawlessly with no vibration. Another purchaser mentioned that he was very surprised by the quietness of this woodworking sander and that it’s perfect for making toys. A happy buyer also says that this is one of the best belt disc sanders available and that he likes the heavy-duty construction. However, some customers have complained that the motor would get hot if you use the sander for several hours continuously and that one dust port would be more convenient than two. A user also states that he received a broken belt sander and he had to return it. 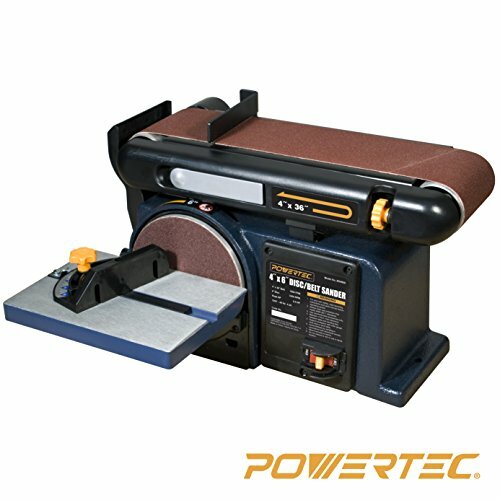 This belt disc sander combination offered by Powertec is easy-to-use, well-constructed and suitable for professionals and novices. Users love the easy belt change, but some do note that it’s noisy. The Powertec belt sander has a size of 22″ x 11″ x 13″, a 4 x 36-inch belt, an adjustable belt platform (0-90 degrees), a 4.3-amp induction motor, a quick-release belt lever, and a 6-inch sanding disc. The sanding table is also adjustable (0-45 degrees), and there is a miter gauge for improved precision, and the base is made of cast iron. Overall, this is an excellent choice for anyone that needs a reliable belt sander. In general, users have a favorable opinion of the Powertec woodworking belt sander, and they praise its performance and usefulness. A buyer comments that this wood sander is powerful, well-built, and easy to set-up and that it’s a piece of cake to change the belt. Another reviewer mentions that this belt disc combo is the perfect tool for his handmade shaving brushes and despite using it regularly it hasn’t bogged down even once. A happy purchaser adds that he is impressed with the quality of this wood sander, but it’s noisier than he expected. One customer also complains that the belt slides off easily and that the sander stops working with no reason. Some other users also complain that it took them a while to figure out how to prevent the belt from slipping off. This belt disc combo offered by Rockwell is well-constructed, durable and powerful. Users love the easy set-up, but some do note that there is no manual. With a size of 12.6 x 10.6 x 21.7 inches and a weight of 41 pounds, this wood sander has a 4 x 36-inch belt, a belt table that tilts up to 90 degrees, a 6-inch disc, an adjustable sanding table, a 4.3-amp heavy-duty motor, and a quick-release belt lever. The package also includes a 45-degree miter gauge, an Allen key, a belt, and a disc sander, so this could be ideal for any professional. In general, users are extremely satisfied with the quality and performance of the Rockwell belt sander combo. The reviewer states that this wood belt sander is powerful, heavy-duty and the belt never slips off. 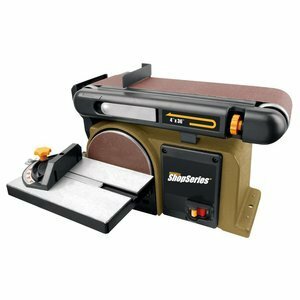 He would recommend it to anyone looking for the best belt disc sander. A customer mentions that the sander is heavy enough to do the job properly, but it’s easy to store it away when you don’t need it. Another purchaser mentions that he has been using the disc sander on cherry and maple hardwood and it does the job quickly and efficiently. However, some customers have complained that the belt wore out fast and that they didn’t receive adequate help from customer support. Some also note that the package was poorly packed and that parts were missing. This wood belt sander offered by Rikon is well-made, reliable and useful for novice woodworkers. Users love the compact design and that it’s easy to change the belt, but some do note that the instructions for use are unclear. With a size of 21″ x 10″ x 11″, this belt sander combo has a steel construction, a heavy-duty base for vibration-free work, a 4 x 16-inch belt, an adjustable belt table, a belt speed of 1900 SFPM, a 6-inch disc and a disc speed of 3450 RPM. Overall, this is an efficient belt sander, but it has some shortcomings. A user shares that he has been using the Rikon belt disc sander for some time and he is very pleased with its performance and usefulness. The reviewer states that the uses the sander for pine wood, and he has achieved excellent results. Another customer mentions that it took him only 10 minutes to set-up the belt sander and that it’s stable, quiet and appears to be well-made. A happy purchaser also comments that this wood sander is much more powerful than he expected and that it’s perfect for small wood jobs. However, some customers have complained that the motor is not strong enough to handle even small pieces of wood and that they had problems with the sanding belt. Some users also state that the motor stopped working after several days or it arrived already broken. 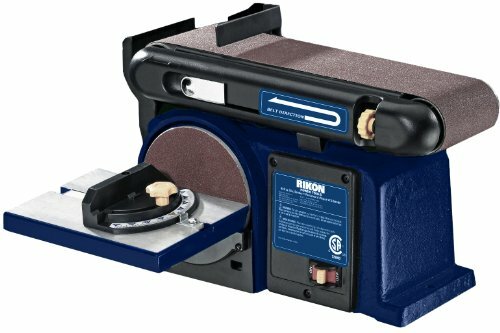 The Rikon 50-151 was another well-received belt disc sander that we examined- it can tilt from 0° to 45° and includes a 2-inch dust port. One reviewer that we spoke with complimented the brushless induction motor, saying that its metal casing ensures long-term durability. As well, all of the sander's screws are machine threaded metal, which is much sturdier construction than plastic and sheet metal. Other buyers told us that they appreciate the heavy and sturdy base that has a dust-protected switch and that there are separate dust ports for disc and belt that can be connected to a vacuum cleaner. One satisfied purchaser told us that it is a truly a high-quality product and that it is engineered with safety in mind so that young and old can use it for sharpening pencils and lawnmower blades, without concern for their safety. You can also find generic belt and disc replacements of solid quality online- so if you wear them out on your home crafts and hobbies you can always find an affordable replacement for those accessories. Another option we examined was the Powertec BD4600 belt disc sander. This particular belt sander has a 4.3 amp induction motor, a solid-feeling cast iron base, quick-releasing belt tension levers, and an ability for the belt platform to adjust from between 0° to 90°, enabling vertical and horizontal sanding. The sanding work table tilts from 0° to 45° with its miter gauge to enable woodworkers to perform precision angle sanding. One reviewer that we interviewed endorses this as a compact and powerful sander that does not suffer from belt slippage. Hobbyists and DIY types enjoy it- particularly when they work on small hand-turned items that don't require an oversized disc for sanding. Speaking with another purchaser, they told us that it is not a variable speed belt disc sander and that you cannot attach a grinding wheel to it, though it is particularly wobble-free during operation and easily ports to a vacuum hose or dust bag. The Rockwell RK7866 belt disc sander was the fourth of the five options that we examined. Its belt platform can adjust from between 0° to 90°, enabling woodworkers to perform vertical and horizontal sanding. The sanding table itself can adjust to between 0° to 45° so woodworkers can perform sanding on beveled edges. It has a 4.3 amp induction motor and also features a quick-releasing belt tension lever so that you can easily swap belts. We did speak with one buyer who was dissatisfied with his purchase of this device, saying that he experienced some belt failures a couple weeks into using it. Another buyer echoed this reviewer's issues saying that there are some technical snafus with the belt. He ended up taking the Rockwell disc sander apart and noticed that the screws to tighten the belts were a little loose and having run it for half an hour he had destroyed the belt and had to purchase a replacement. On the other hand, another reviewer that we interviewed said that they were extremely satisfied with the low-price that they purchased it for, saying that it has a powerful motor, it's easy to set up and, as opposed to the other reviewer who had issues with the belt, said that the belt track worked seamlessly for them. 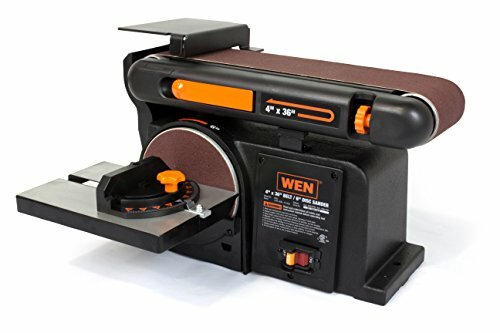 A Wen 6502﻿﻿ disc sander buyer we spoke to who described himself as a DIY hobbyist who enjoys making smaller items of furniture says that this particular belt sander is a great fit for his garage workshop- saying that changing the belt is pretty easy, taking around 30 seconds. As well, making adjustments to the belt is also pretty simple. As the other reviewer told us, he appreciated the metal construction of the belt sander, heavily preferring it to cheaper plastic design materials. Another reviewer that we conferred with said that while this is a China-made product, he was satisfied that he got good value for the expense of purchase. Another reviewer we interviewed endorsed the sturdiness of the table but does complain that the miter gauge is a little bit too loose inside of its track. He says that when he is not using it he will often remove it because the rattling noise is distracting. It comes in four different styles- a 1" x 5" sanding disc, 4" x 6" cast iron base, a 4" x 6" steel base and a 6" x 9" floor standing model. Another buyer who was skeptical of other belt sanders because of the over-reliance on plastic in their construction was satisfied with the 4" x 6" model he purchased, saying that it is solidly constructed with a metal chassis. The only plastic that he has observed on this unit is located on the switch toggle, the belt tracking knob, miter gauge, the belt shroud and the belt tension release handle. The last disc sander we looked at was the Rikon 50-112 sander. Its manufacturers say that it is made from steel and cast iron to provide a heavy-duty base for vibration-free functioning. Its belt speed reaches 1,900 SFPM with a disc speed of 3,450 RPM, and includes direct drive for enhanced reliability and torque. One buyer that we spoke to who complained of having purchased cheap Chinese knock off belt disc sanders in the past, says that this particular sander is sturdy and well-designed. One buyer did experience some problems with the drive belt to start- saying that because it was not accurately tensioned in the factory when he began to use it, it stalled on the pressure and basically ripped itself apart. This buyer told us he had to contact their customer service department and they were happy to send him out a free belt replacement. Another buyer who we spoke to says that when he initially tried to change the belts that he found them a little bit resistant, but they did loosen up with time. He advises new users that when they begin sanding, maintain a light touch and allow the sandpaper to do the work. 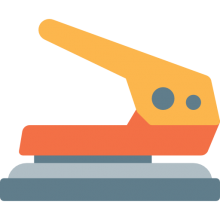 As long as you don't overload it, the sander will work well for you- but if you are expecting it to perform standing on large surface areas, you would be better off purchasing one with a much more powerful motor. This is certainly not a commercial-standard sander, but if you are in the market for a small, residential option for your home woodworking shop than this could be a quality option for you. There are actually a variety of different sanders out there depending on the sort of job you are working on- drum sanders, orbit sanders as well as straight-line sanders. It would appear that woodworking is the most common type of job material that these sanders are used on. However, they are often employed on aluminum and plastic. One of the primary advantages of a disc sanders is that its hands-free operation allows you to direct your wood material as you see fit. When it comes to pricing, many people look to purchase their disc sanders from Home Depot, Harbor freight, or even resort to other popular e-commerce retailers- but there truly is a lot of price variation depending on whether you are looking for a factory-quality model or a smaller option more suited for DIY hobbyists to use in their garage workshops.